Greenway Plaza, a 4.4 million SF office complex in Houston, is now owned by Canadian investors. HOUSTON — (Realty News Report) – Canada Pension Plan Investment Board has finalized its $1.2 billion purchase of Parkway Inc., one of the largest property owners in Houston. 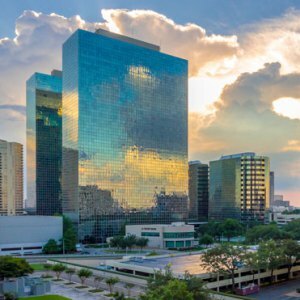 The Parkway portfolio totaled 8.7 million square feet of Houston office space including the 1.3 million SF Post Oak Central, the 627,000-SF Phoenix Tower in Houston, the 980,000-SF San Felipe Plaza, and the 1.5 million SF CityWest Place in Westchase and the 4.4 million-SF Greenway Plaza. Parkway Inc. was a pure-Houston play with 100 percent of its holdings located in Houston. It was born as the result of the Cousins/Parkway merger. The ancestory tree goes like this: At one time Cousins and Parkway were separate companies with sizable holdings in Houston. The Houston office marketed tanked when oil fell from a high of $107 a barrel in June 2014 to less than $30 a barrel in early 2016. Houston energy firms laid off thousands of employees and vacated huge chunks of office space. Publicly traded firm with significant portfolios of Houston office space were under pressure. Security analysts criticized them. So Cousins and Parkway merged, all of the Houston properties were stripped out and placed into a new company, Parkway Inc.
Now, the oil markets have stabilized. Houston’s office market, is still soft and vacancies are high, but it appears to be on the road to recovery. The Canadian investors had already purchased a major stake in the 10-building Greenway Plaza, the crown jewel of the Parkway portfolio. With this additional $1.2 billion deal, which closed last week, the Canada Pension Plan Investment Board acquires all that remained of Parkway. And it is now one of the largest owners of Houston office space. Headquartered in Toronto, with offices in Hong Kong, London, Luxembourg, Mumbai, New York City, São Paulo and Sydney, CPPIB is governed and managed independently of the Canada Pension Plan and at arm’s length from governments.